"For all those brave men and women heading to Houston to help, free transportation and parking is the least we can do." Rodeway Inn & Suites - Fort Lauderdale Airport & Cruise Port, a budget-friendly, full-service cruise hotel near Fort Lauderdale Port Everglades Cruise Port and near the Fort Lauderdale/Hollywood International Airport (FLL), is doing its part to assist the victims of Hurricane Harvey by offering parking and transportation at no charge to First Responders headed to Houston. Hurricane Harvey caused catastrophic flooding in Houston, Texas, and the surrounding areas, leaving thousands in need of emergency services. First responders from all over the country are heading to Texas to assist in rescue efforts as well as distribution of food, water and shelter for all those left homeless by the extreme flooding. To help, Rodeway Inn & Suites - Fort Lauderdale Airport & Port Everglades Cruise Port announced that First Responders leaving for Texas from the Fort Lauderdale/Hollywood International Airport (FLL) are welcome to park in the hotel's long-term parking lot at no cost, and utilize the hotel's in-house shuttle transportation fleet to get to and from the airport, also free of charge. "We must do our part to help those affected by this tragedy," stated Izzy Fintz, General Manager of Rodeway Inn & Suites - Fort Lauderdale Airport & Port Everglades Cruise Port. "For all those brave men and women heading to Houston to help, free transportation and parking is the least we can do." In addition being the hotel's General Manager, Izzy is also a member of Hollywood, FL CERT, the Community Emergency Response Team, a program that educates local volunteers on disaster preparedness. Rodeway Inn & Suites Fort Lauderdale Airport & Cruise Port is a budget-friendly, full-service Fort Lauderdale cruise hotel in close proximity to popular South Florida tourist destinations such as Downtown Fort Lauderdale, Fort Lauderdale Beach, Broward Convention Center, Port Everglades Cruise port and the Fort Lauderdale/Hollywood International Airport (FLL). Rodeway Inn is a top hotel for cruise vacationers, providing cruise port and airport shuttle services, long-term cruise parking as well as Day Rooms for disembarking guests. Amenities include complimentary breakfast, heated outdoor pool, whirlpool tub suites, tour packages, tropical garden, guest business center, fitness center, Wi-Fi, a full-service Forgot Something gift shop and dining at the Marina 84 Sports Bar & Grill. 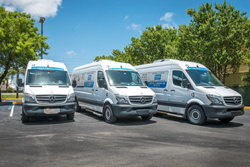 All Rodeway Inn shuttle pick-ups, drop-offs and guest reservations are managed via the cruise hotel's integrated web-based proprietary fleet and parking management system, ShuttleQ.com. For more information on Rodeway Inn & Suites, visit http://www.hotelftlauderdale.net or follow the hotel on Facebook. Rodeway Inn & Suites Fort Lauderdale is a member of Choice Hotels International, Inc.® (NYSE: CHH).